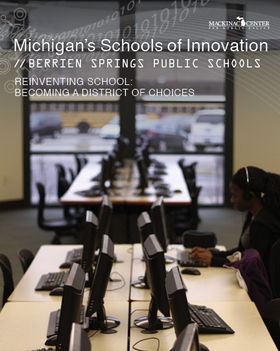 The Mackinac Center recently published a case study of Berrien Springs Public Schools. It is available at mackinac.org/SchoolsOfInnovation. At a time when some education officials are blaming school performance on student background and a lack of funding, the success of Berrien Springs Public Schools provides a welcome contrast. When Superintendent Jim Bermingham first came to the district, Berrien Springs’ enrollment had plateaued, and the district was facing increasing expenses. The district also has a large share of students from disadvantaged backgrounds: More than 60 percent of Berrien Springs students qualify for free or reduced-price lunch. Berrien Springs is rethinking the notion of districts bound by lines on a map, well ahead of lagging state policy. Instead of viewing this as a burden or as an excuse, Bermingham and others looked at their ability to serve students from disadvantaged backgrounds as an opportunity. By implementing an open-door enrollment policy, expanding alternative education programs and working to innovate beyond the geographical confines of district boundaries, Berrien Springs is a model of innovation for other conventional districts. This past year, several school districts made news by heavily restricting which students could enroll through Schools of Choice. The Birmingham school district, for example, offers just a handful of seats under the program to nonresident students, while simultaneously offering many seats to students who are able to pay $13,000 in tuition. In comparison, Berrien Springs opens its school doors widely: More than 300 Benton Harbor students used Schools of Choice to attend Berrien schools this year. Though many school districts are cutting or limiting alternative education programs, Berrien Springs has worked to expand and improve its programs. Indeed, Bermingham says that 75 percent of his district’s alternative education students come from other school districts. The Berrien Springs Alternative Education Center is one of the district’s alternative education programs, and the Center makes use of a software-based instructional program that allows students to work through material at their own pace. Students can work through coursework wherever they have an internet connection, and teachers are physically available in the school between 7:30 a.m. and 8:30 p.m. In recent years, enrollment at the Alternative Education Center has more than quadrupled and has drawn in students from outside the district. Berrien Springs officials also created an alternative education program to serve at-risk high school students in Battle Creek — more than 80 miles away from the district. The Battle Creek program enrolls 275 students, and its first graduate was an 18-year-old mother who did homework at night after putting her child to bed, said Principal Bob Kubiack. Berrien Springs has entered into partnership agreements with five other districts to operate virtual alternative schools. Bermingham says said he anticipates enrolling 200 more at-risk students in those partnership schools. If successful, these partnership agreements could serve as an example for other districts interested in looking to innovate outside of geographic and conventional boundaries. Berrien Public Schools’ innovation and service to at-risk students has certainly paid off. Enrollment has steadily increased during the past five years, from about 1,830 students to 2,260 — a 23 percent increase. The district’s fund balance has also grown — from 4 percent to more than 20 percent. Meanwhile, the district is spending less per student than it did five years ago. Berrien Springs is rethinking the notion of districts bound by lines on a map, well ahead of lagging state policy. More money isn’t needed to spur innovation among Michigan’s conventional schools. If Berrien Springs is any indication, increased flexibility and the ability to experiment with new programs could enable schools to better serve their students and bring about impressive results. Audrey Spalding is director of education policy for the Mackinac Center for Public Policy, a research and educational institute headquartered in Midland, Mich. Permission to reprint in whole or in part is hereby granted, provided that the author and the Center are properly cited.